In the last few years, Alienware has introduced some uniquely-designed desktops with the head-turning Alienware Area 51 and space-compressing Alienware Aurora R5. Now, the space age computing company introduces one of the world’s thinnest gaming laptops yet with the Alienware 13 R3. The 13 R3 also sports the company’s new hinge-forward design, quad-core Intel Core i7 HQ-series processors and Nvidia Pascal graphics – making it a VR-capable machine. However, this 13-inch gaming notebook’s killer feature is an OLED display that’s so vibrant, it can almost make you forget about the $1,799 or £1,749 (about AU$2,400) price you’ll have to pay for all this beauty. Luckily, you can also get in on the ground level with a $1,199 or £1,249 (about AU$1,600) model with a standard HD screen. Alienware’s designs have always set its devices apart from all other gaming laptops with more lights and premium materials. This year, however, the biggest differentiator is that hinge-forward design reminiscent of the Dell Adamo. To get a 21% thinner, 0.87-inch (0.22cm) thick chassis, Alienware has moved the heatsinks normally positioned beneath the keyboard to a bump that extends 1.5 inches behind the screen. 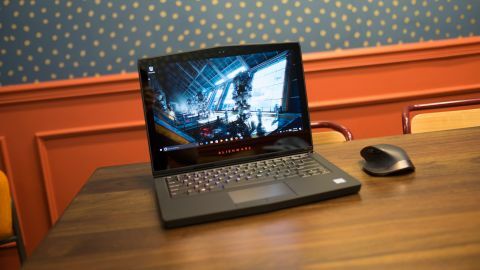 Alienware also makes smart use of the extended rear for full-sized ports, including HDMI, Ethernet and the company’s proprietary Graphics Amp connector. However, the laptop’s extended, 10.6-inch depth and boxy shape makes it hard to stuff in many 13-inch laptop bags. It wasn’t until we tried our backpacks meant for 15-inch notebooks that the Alienware 13 would actually fit. What’s more, with the laptop weighing in at 5.8 pounds (2.6kg) – nearly a pound heavier than most 15-inch notebooks – it’s one dense package. Despite the need for bigger bags to carry around this laptop, we dig the new design. The thinner shape is accentuated by an equally sharper frame, etching away the subtle curves of the previous model. Rather than looking like an armored briefcase from space, the new design evokes a much more modern clamshell notebook. From the side, you can see the strata of this laptop’s build transition from one solid sheet of aluminum to another with soft-touch coated magnesium sandwiched in between. Alienware’s older designs would normally mask these transitions with metal that curved around the edges, but we like exposed nature of it, like a Manhattan apartment with exposed brick walls and wooden rafters. One thing we do miss about the older model is the exterior track lighting. While Alienware’s larger gaming laptops come with strips of lighting along the edges, you won’t find them here. Alienware says it came down to making the laptop thinner or flashy, and it chose the former, as it would also help prolong battery life. Technically speaking, though, the new Alienware 13 actually features more customizable lighting zones than ever before. The keyboard is now separated into four distinct zones (one more than its predecessor) while the trackpad comes with a backlight for the first time on 13-inch models. Combined with the Alienware logo on the lid, stylized power button and the glowing branding on the bottom screen bezel, users can individually program these eight areas to show off 20 distinct colors complete with lighting effects. Alienware’s new and thinner design is evidently different from years past, but beyond the skin-deep changes, there has been plenty of reengineering on the inside. This year, Alienware has introduced copper elements to improve the ventilation, which you feel with most of the heat being drawn away from the keyboard and touchpad. This is also one of the few thin gaming laptops that doesn’t sound like a shop vacuum while under load. Alienware has also introduced a steel plate to reinforce its Alienware TactX keyboard, eliminating any bit of keyboard flex. What’s even more impressive is that the keys offer 2.2mm of travel that’s even more satisfying than some mechanical keyboards we’ve used. Likewise, the 13 R3 is the first Alienware to feature touchpad buttons, whereas the older R2 model had a press-to-click touchpad. It’s still no replacement for a gaming mouse, we never felt like we needed to dive for one whenever we were just checking Facebook on this machine. Side-firing speakers are usually a disappointment, but these reengineered ones produce loud and clear sound with enough bass to make them decent for gaming. What’s more, they sit up high up enough off the base of the notebook so they’re not muffled out when you put it on your lap. We’re not ones to be easily wowed, but our bottom jaw was on the floor upon first laying our eyes on the new Alienware 13’s OLED display. Colors virtually drip off the OLED panel with a richness rivaling any production monitor we’ve seen before – even the new MacBook Pro’s P3 color space-enhanced display. And, as if that wasn’t impressive enough, the Alienware 13 also produces the deepest blacks that seamlessly blend into the surrounding screen bezel. More than a few times, we caught ourselves lingering on Windows 10’s lock screen backgrounds just to bask in the saturated color and sharp contrast. Likewise, this screen elevates the quality of everything you look at whether it be movies and pictures or the black text of this very review. On top of being one of the most vivid displays, the Alienware 13’s OLED screen lends itself surprisingly well to games, thanks to a one millisecond refresh rate. That’s faster than the TN panels you’ll find on most gaming laptops and monitors, with image quality that’s prettier than any IPS screen – or even the Razer Blade’s IGZO display. Thanks to the hinge forward design, the display also sits directly above the keyboard for a more intimate typing experience. What’s more, the screen now hovers above the rest of the notebook,tethered by two hinges, allowing you it back a full 180-degrees. Most gamers probably won’t find any use out of this wide degree of articulation given the laptop will likely either just be sitting on a desk or hooked up to an external monitor. But, the added flexibility could come in handy if you’re using the Alienware 13 laying down or sitting on top of a cooling platform.